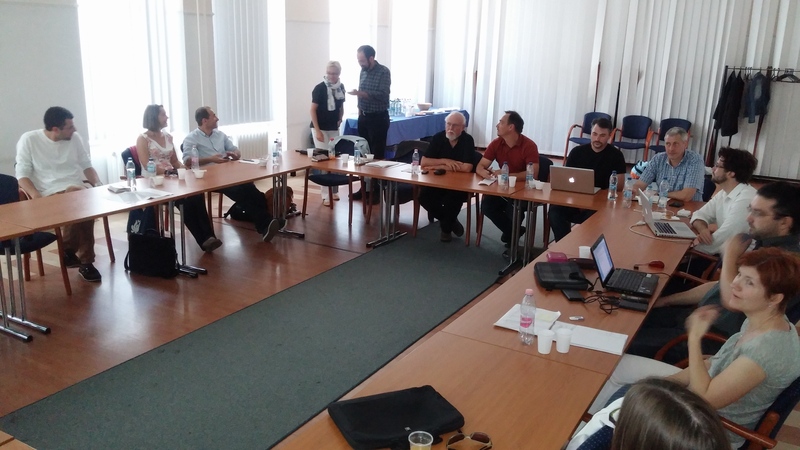 On June 20th, the directors of six regional archaeological projects met during the first Hungarian Archaeological Research Circle (HARC) at the Hungarian American Fulbright Commission in Budapest (http://www.fulbright.hu/hungarian-archaeological-research-circle/). BAKOTA project directors joined leaders of the Körös Regional Archaeological Project (KRAP), the Neolithic Archaeology and Soilscapes Körös Area (NASKA) project, the Yamnaya Impact Project (YIP), the Borsod Plain Bronze Age Settlements (BORBAS) project, and the Kakucs Valley and Benta Valley projects. Each project talked about the intrusive and non-intrusive methods they were using in their respective regions, and the group discussed ways to reconstruct regional dyanmics and achieve comparable datasets. Thanks to Károly Jókay, the executive director of the Hungarian-American Fulbright Commission, for hosting us, and to Danielle Riebe (Ph. D. student at University of Illinois-Chicago) for helping to organize our session!